Movie tie-in games: the final frontier. 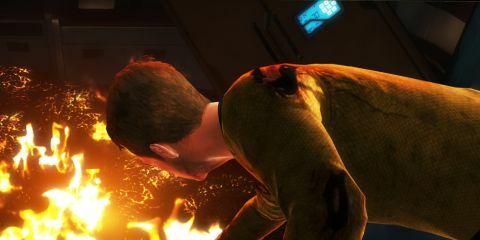 These are the co-op adventures of Captain Kirk and Commander Spock, based on the alternate universe created in J.J. Abrams' 2009 movie Star Trek. Its 8-hour mission: to challenge you with monotonous tasks and broken third-person shooting mechanics; to seek out new ways to test your patience with uncooperative AI; to boldly go where no game should ever go again. Star Trek's story reimagines the crew's first encounter with the Gorn, a race of giant space lizards made famous from Kirk's epic battle in the original series episode "Arena." In the game, the Gorn have stolen the Helios device , an item that holds the power to terraform planets and rip holes in space. Naturally, the captain and his first mate must retrieve it. The plot does a satisfactory job of keeping the experience feeling like a Star Trek adventure, leading you to some interesting locales, like the Gorn's home planet, New Vulcan, and the USS Enterprise itself. Plus, there are nods to the TV episodes that are sure to please true fans. "The plot does a satisfactory job of keeping the experience feeling like a Star Trek adventure..."
As you play through missions, you'll generally be doing three things: hiding behind cover in a firefight, sneaking up on enemies for stealth kills, or hacking computer terminals. These elements would make an entertaining mix of gameplay, if only the cover controls weren't extremely clunky and character animations so choppy. You'll often find yourself accidentally rolling out into the open rather than sticking to cover, since roll and cover are assigned to the same button. Even simply moving around the environment and basic platforming can be a challenge, due to inconsistent collision detection and failed animations. These issues become especially prevalent when you choose to take the stealth route. Sneaking offers alternate avenues for getting through dangerous situations as well as additional points to spend in the upgrade system, but you'll have a hard time staying hidden as you fumble with the controls. Then there's hacking. One item you'll be using as much as (if not more) than your weapons is your tricorder. With the handy device you can unlock doors from a distance, scan the environment for enemies and interactable objects, and hack computer panels. The problem is, almost any time you want to interact with anything in the environment, whether it be a door, locked box, or warp drive engineering station, you'll have to play a hacking minigame to move on. After you've played the Snake-like grid hack and radio wave matching hack a dozen times in one mission, you'll wish you could virtually stomp your tricorder into space dust. "...simply moving around the environment and basic platforming can be a challenge." On the bright side, there is a fair amount of variety to combat thanks to the equipment upgrades and the tricorder integration. Phasers can be upgraded to do things like show enemy weak points when set to stun, or ricochet blasts off walls. Your tricorder can also be modified do things like cause enemies' grenades to explode prematurely, or boost your partner's protective shield. These upgrades provide interesting tactical options that almost make up for the overall lack of enemy and weapon variety. But the most enjoyable element of Star Trek is, by far, the voices and likenesses of the movie cast. Chris Pine, Zachary Quinto, Simon Pegg, and the rest of the crew reprise their roles, making the in-game dialogue and cinematic cutscenes feel like they were ripped directly from the movie. Kirk and Spock's relationship in particular holds the weight and charm it does in the movies and TV show, as Spock's logic challenges Kirk's brash, fly-by-the-seat-of-his-pants nature. "...the most enjoyable element of Star Trek is, by far, the voices and likenesses of the movie cast." However, the duo's strong relationship doesn't translate into good co-op gameplay, especially when going it alone with the AI in the campaign. Star Trek is best played with another person (online or local split-screen) as you shoot through Gorn troops and combine your efforts to solve uncomplicated puzzles. On the other hand, your AI partner will constantly need assistance from being downed by enemy turrets and absorbing too many phaser blasts, and they're no help in a fight. In most situations, they'll prefer to sit behind cover and take random potshots while the enemy units surround and kill you, restarting you at the next checkpoint. Also, the AI makes stealth objectives frustratingly difficult to achieve, as your partner will wander out and attract the attention of every enemy in the vicinity. From a gameplay perspective, Star Trek is hindered by its unpolished character animations, clunky controls, and repetitive hacking minigames. While it can be entertaining to experience the return of the movie's cast to their roles as the beloved Star Trek characters, it's difficult to get past the gameplay's shortcomings. Those who are looking to immerse themselves in the exciting moments of the blockbuster film series might find some satisfaction in the futuristic shootouts and iconic locations, but you'll be disappointed in Star Trek's overall sub-par quality. Description In Star Trek, the adventure continues off the JJ Abrams Star Trek 2009 film where Kirk and Spock must work together to stop a legendary enemy race bent on conquering the galaxy.